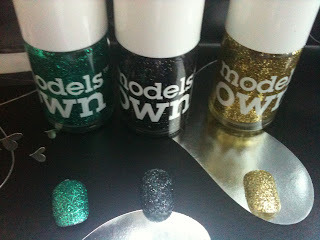 I got this set way back in December and was the first couple of Model's Own products that i got to try. Sadly the set that i've got is not available on the site, but there are 2 other glitter sets that you could purchase here. The pigmentation in these polishes are the bomb! "gaga' glitters you want cause seriously these glitter polishes remind me of Lady Gaga, Dont you? If ever you wanna go that extra mile, use one of these on your nails!! If you have always wanted to try the glitter polishes? or you can find them at your local Boots, ASOS and even River Island! 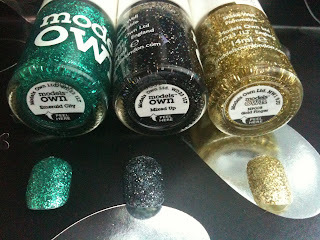 Have you tried products from Models Own, or want to try? What are your must have/Faves?